AcademicsSchoolsSchool of PharmacyOur NewsDuquesne University And Ursuline College Partner To Offer Students Accelerated Path To Pharm.D. Duquesne University And Ursuline College Partner To Offer Students Accelerated Path To Pharm.D. Ursuline College and Duquesne University School of Pharmacy are partnering to offer students the opportunity to earn their bachelor's degree and doctor of pharmacy degree in seven years instead of eight. After three years of majoring in chemistry at Ursuline, a women-focused college in suburban Cleveland, qualified students may enroll at Duquesne, a co-educational university in Pittsburgh, where their first year of pharmacy school will fulfill their undergraduate degree, earning the bachelor's degree in chemistry from Ursuline College. The Ursuline graduates would spend four years in Duquesne's doctor of pharmacy (Pharm.D.) program. Representatives of the two schools signed an articulation agreement on June 26. "We at Ursuline College are delighted to be able to offer future pharmacists this chance to begin their college career with us, in a women-focused, supportive environment," said Ursuline President Sister Christine De Vinne, OSU, Ph.D. "After three years at Ursuline, students will be well prepared to embrace the professional opportunity of the Duquesne doctoral program. They will eliminate one year of college expenses and enter their careers one year sooner than they would have after a typical eight-year Pharm.D. program." For young women majoring in science, technology, engineering or mathematics (STEM), research indicates a real advantage to attending a women's college. According to a May 9, 2016 article on USNews.com ("Where women thrive in STEM"), "Women's colleges provide a unique, supportive environment for women to succeed in science and math." The article goes on, "The inherent structural advantages of a women's college enable numerous women to persist and succeed in STEM fields." "We are excited about the relationship between Ursuline College and the Duquesne University School of Pharmacy. The articulation agreement provides young women the opportunity to earn a bachelor's degree in science and a Pharm.D. 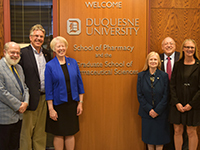 and to continue on to become a successful pharmacist who improves patient outcomes while living the true mission of both universities," said the Dean of the School of Pharmacy at Duquesne University J. Douglas Bricker, Ph.D. Since opening in 1925, the Duquesne University School of Pharmacy continually earns recognition as a top school of pharmacy in the United States because of outstanding academic programs, hands-on training, and nationally recognized research and leadership. Graduates learn the skills necessary to be successful in the present and the future and always practice with integrity. The program received a 2015 Pinnacle Award from the American Pharmacists Association Foundation; is ranked third in research funding among private schools of pharmacy by the National Institutes of Health; and is ranked second among Catholic schools of pharmacy by the U.S. News and World Report. According to the US Bureau of Labor Statistics, the 2016 median pay for pharmacists was $122,230. Both Ursuline and Duquesne are independent, Catholic colleges welcoming students of all faiths. Both trace their roots to French religious orders. The Ursuline order of nuns was founded in Italy in 1535 and spread across Europe. The Ursuline Sisters of Cleveland came to the U.S. from Boulogne-sur-Mer, France in 1850 to establish the first Catholic schools in the Cleveland diocese. They founded Ursuline College in 1871. Duquesne University was founded in 1878 by a group of Catholic missionaries, the Congregation of the Holy Spirit, also known as the Spiritans. The Spiritan order was founded in rural France in 1703. Spiritan priests came to Pittsburgh to establish schools for children of the city's immigrant communities. For more information about enrolling in the Ursuline-Duquesne program, contact the Ursuline College admissions staff at 440 646 8108 or admission@ursuline.edu.